Last weekend we played Settlers of Catan. 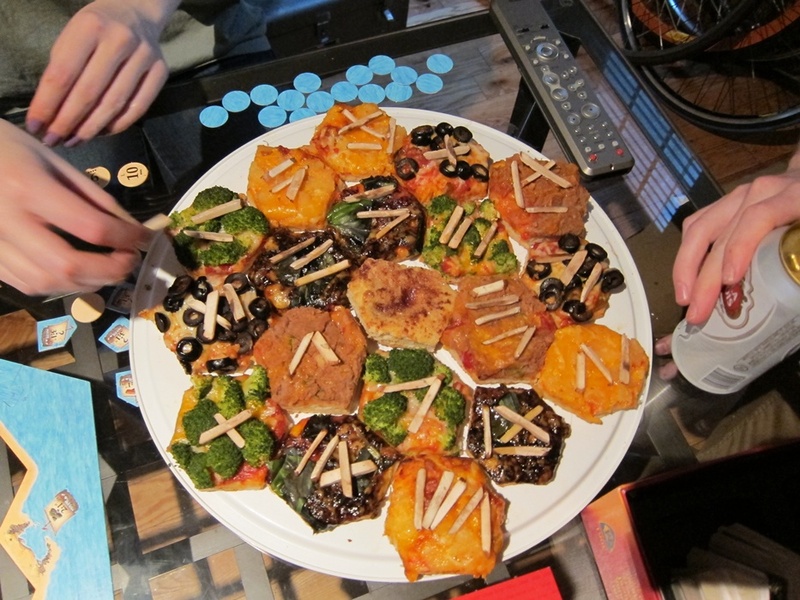 The exciting, relevant part of this is, that we played it with food! This pizza dough was the base of our board pieces. Dissolve the sugar and yeast with the water in a large bowl. When the yeast has begun to bubble, stir in one cup of flour, followed by the oil and salt. 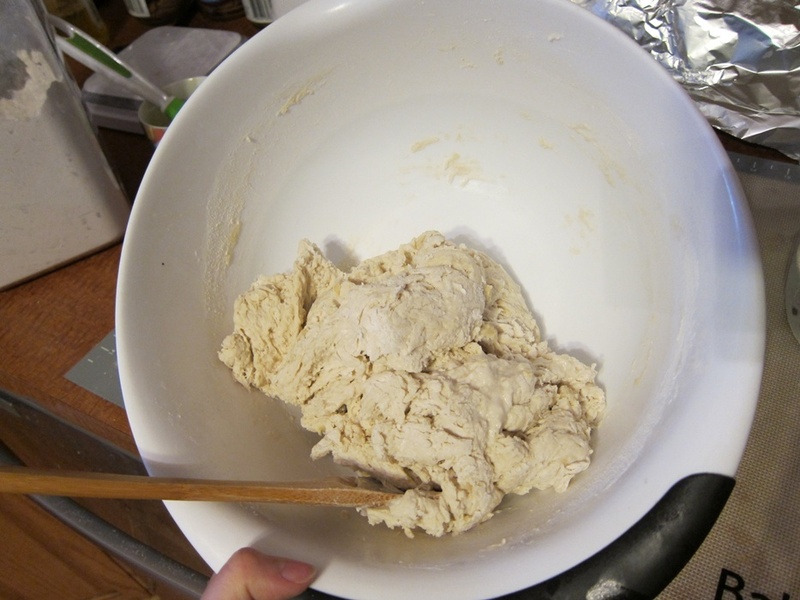 Add the next 4 1/2 cups flour, stirring together until the dough holds mostly together in one big lump. Sprinkle the remaining half cup of flour on a clean surface and turn out the dough to knead. Knead for 3-4 minutes, then stop to clean, dry, and grease your bowl. Knead several more minutes, until smooth and springy, then form into a ball. Put the dough into the ball and turn to grease all over. Cover and let rise somewhere warm and draft-free for an hour, or refrigerate for several hours. When ready to eat, preheat the oven to 475 degrees. 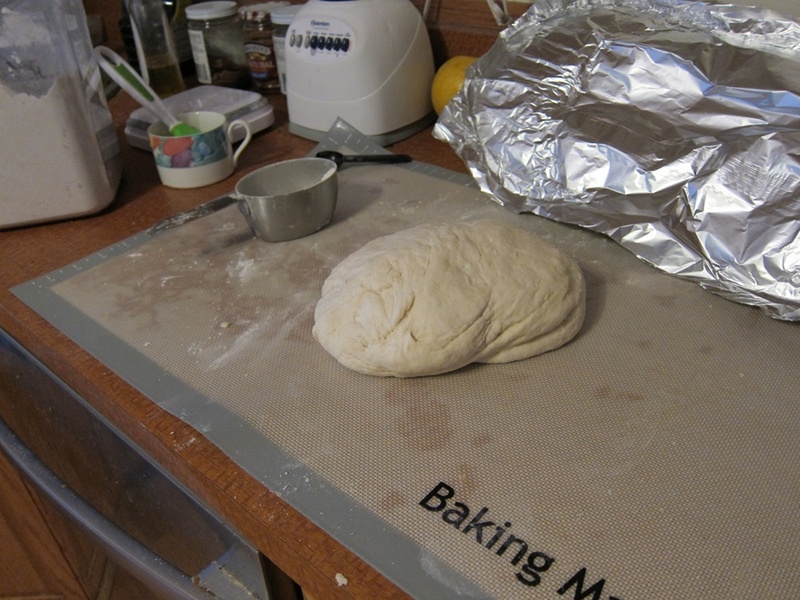 Roll out the dough, stopping to let it rest 2 minutes if it keeps shrinking back. Decorate your pizza as desired. 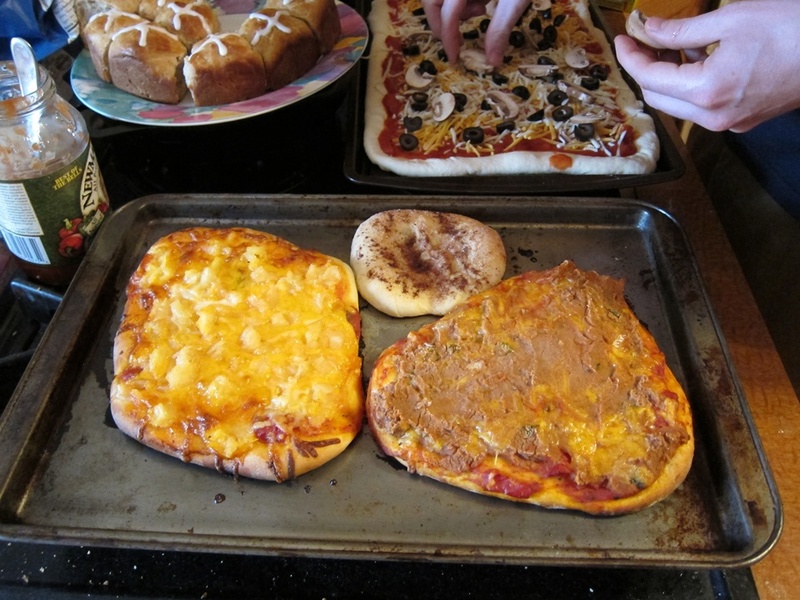 Bake the pizza 15-20 minutes, until the crust is golden brown. It’s a good dough, perfectly suitable for cutting into hexagons! Never put the desert in the center. It's such a problem! 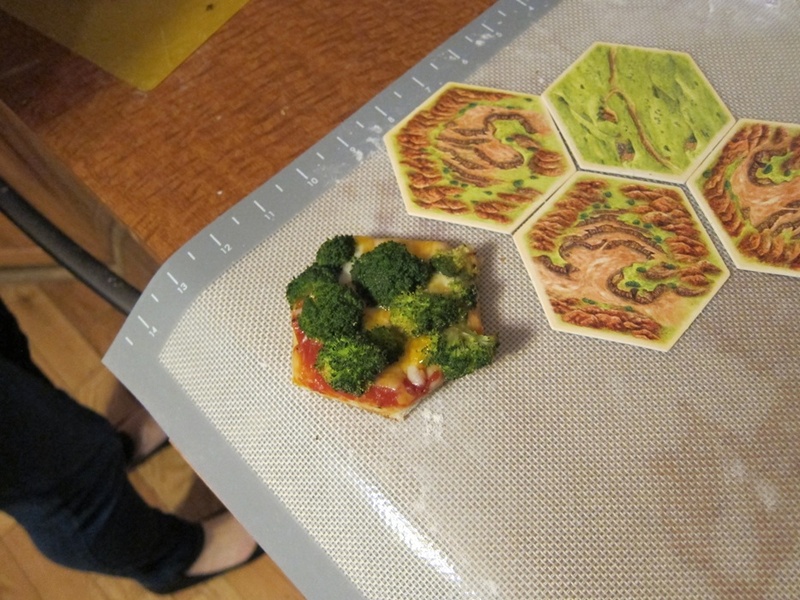 Yay nerdy pizza! I’ll be submitting this to YeastSpotting. From the King Arthur Flour 200th Anniversary Cookbook. Dissolve the sugar and yeast with the water in a large bowl. 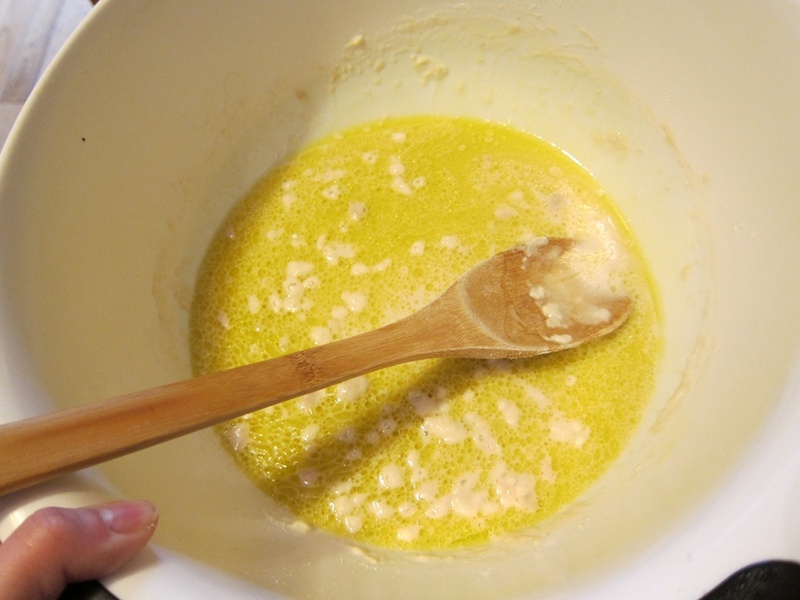 When the yeast has begun to bubble, stir in one cup of flour, followed by the oil and salt. Add the next 4 1/2 cups flour, stirring together until the dough holds mostly together in one big lump. Sprinkle the remaining half cup of flour on a clean surface and turn out the dough to knead. Knead for 3-4 minutes, then stop to clean, dry, and grease your bowl. Knead several more minutes, until smooth and springy, then form into a ball. Put the dough into the ball and turn to grease all over. Cover and let rise somewhere warm and draft-free for an hour, or refrigerate for several hours. When ready to eat, preheat the oven to 475 degrees. Roll out the dough, stopping to let it rest 2 minutes if it keeps shrinking back. Decorate your pizza as desired. 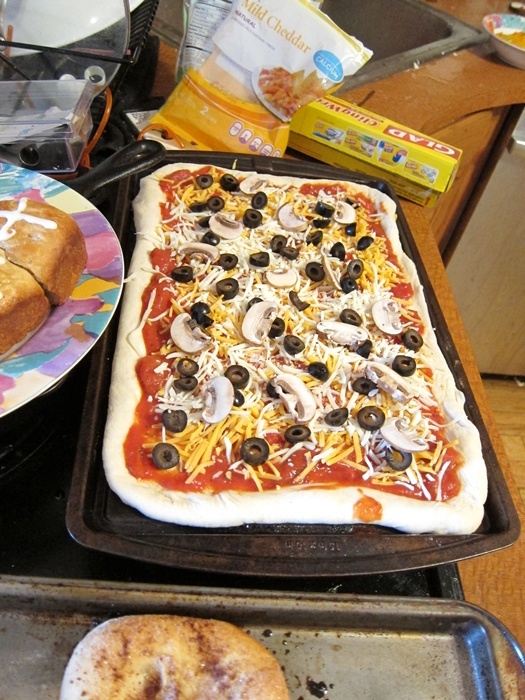 Bake the pizza 15-20 minutes, until the cheese is melted and the crust is golden brown. This entry was posted in Bread, Dinner, Party! 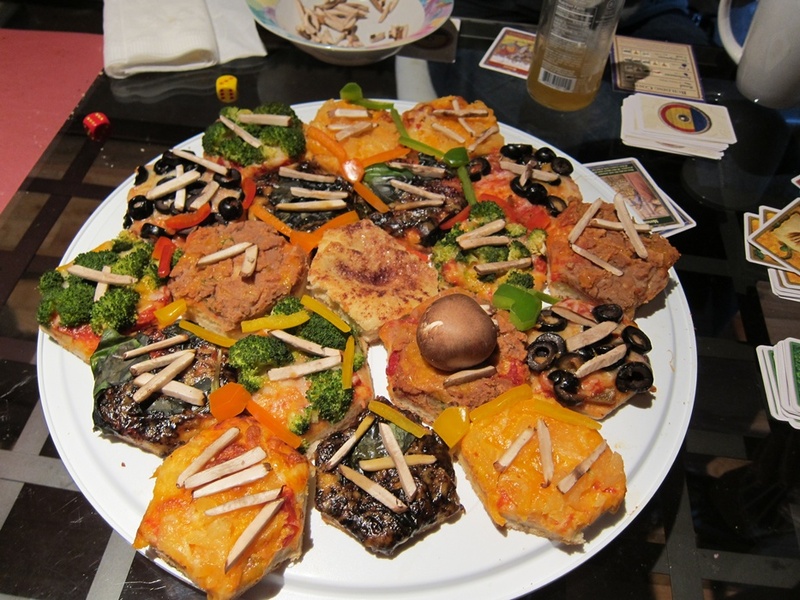 and tagged pizza dough, Settlers of Catan. Bookmark the permalink. After several pizza dough tries I finally decide to make your dough as my favorite pizza dough. I use 4 cups of Italian durum flour type 550 ( europeen) and 2 cups of Semolina. They are super as pizza and plane as bun. Thanks and greetings from the Netherlands. Great, glad to hear it worked out well for you!